A monumental pointed Gothic Revival building in patented red bricks from Edward Gripper in Maperley, Nottingham. There are stone dressings from Ketton, Ancaster and Mansfield. The windows are flanked by shafts of pink and grey granite from Peterhead. 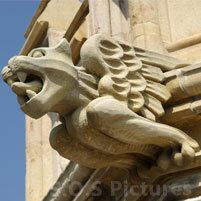 The design is by architect George Gilbert Scott based loosely on The Cloth Hall in Ypres. The roof was originally slated with graduated tiles with a blue hue from Groby-Swithland in Leicestershire, re-slated with graduated tiles with a green hue from Westmoreland in 1993-5. 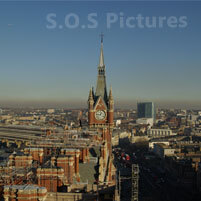 The frontage to Euston Road is approximately 585 feet (178.3m), between Midland Road and Pancras Road. 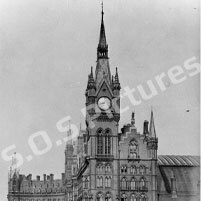 There are 23 windows flanked by towers, a curved 10 window wing to the west and the Eastern tower has pinnacles at each corner and a spire with a weather vane, a four-faced gabled clock and an Oriel window at first and second floor levels. There are four substantial storeys visible and two further storeys contained in the roof and lit by stacks of gabled dormer windows. There are a further two storeys below this platform-level frontage. The timberwork on these dormer windows is now grey after the exterior work in the 1990s, and previously white, as were all the windows and frames. The station and hotel are approached by a dramatic ramp rising from the western end of the Euston road elevation with an arcaded retaining wall having an inset shop at the eastern end and an entrance now into the western ticket hall. The Euston Road entrance into the Underground ticket hall was once a shop space and to its left some way was a foot tunnel leading up onto the concourse of the Station. The station end of this foot tunnel now has stairs leading down into the aforementioned Underground ticket hall. 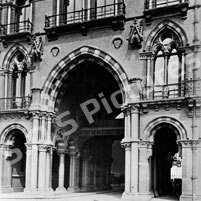 The station was accessed via two pointed, rib-vaulted vehicle arches, flanked by pedestrian arches, the western one of which now provides the main pedestrian access to the hotel. Originally this western arch was the entrance to the departures cab road, with pedestrian access directly to the Booking Office and then through to the concourse. The cabs were able to continue along this roadway towards the north until they entered a steep roadway down into Midland road. The covered cab road was also used for access for deliveries and parcels through the gates of the delivery yard to the right of this steep roadway. The iron and glass roof covering this roadway was made by James Haywood of Phoenix Foundry, Derby. 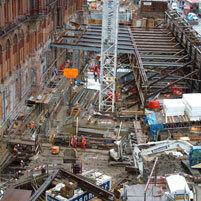 There are 18 openings between the arches at platform level. The eastern archway, flanked by empty statue niches at first-floor level, was the way out from the arrivals roadway, 25ft (7.62m) wide. Pedestrians, cabs and parcel vehicles originally exited here, with access for the cabs in Pancras road. Both of these vehicle roadways were in use until Easter 2004. 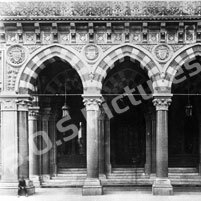 Both archways have recessed, elaborately patterned and foliated cast-iron pedestrian bridges carrying the first-floor corridor. There are timber-tracery windows between the ironwork of these bridges and the rib-vaulted ceilings. The windows on each bridge are of a different design from one another and they each have an opening window offset from the centre which stops them being symmetrical - to the north though, the opening window is opposite to that on the south, meaning that these windows are symmetrical with one another. The opening window was to allow access for lighting and extinguishing the gas lamps that were hanging in the external recess originally. There are five windows to the east of the eastern arch. The roof drainage is hidden behind the balustraded parapet. Pipework carries the drainage through the brickwork and allows it to fall into a large ornate cast-iron hopper atop a square downpipe secured with ornate brackets which carries on down below ground level and empties into a drain at basement level. The hotel façade here has round-arched platform-level windows linked by impost bands. 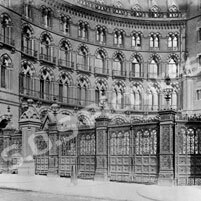 The original 'Terrace Entrance' was central to the bay windows in a row of eight windows and the iron entrance roof covered what is now a window to the left and the fire exit from the Chambers Club. Traces of where this roof sat against the building can be seen in the mouldings above these two openings, the ends of which are missing their ornamentation and are crudely finished with mortar. A new residential entrance has been created to the east of the western arch with ramp access. On the first floor there are pointed 2-light French windows with tracery above and granite shafts either side and central to the glazing. A continuous corbeled stone balcony with elaborate iron handrails spans the façade between the two entrance arches; on the second-floor, French windows, surrounds cusped with granite shafts either side, individual stone balconies with iron handrails at each one; on the third floor, arcaded sash windows of 3 lights separated by granite columns. These windows have stone aprons with a diamond and flower design in each. The façade is articulated vertically and horizontally with strings and much elaborate carving. Above these four levels is a corbeled Scalloped frieze below a stone and brick balustraded parapet. The western tower has four storeys of elaborately arcaded windows above the archway with Lombard friezes and bartizans with spires at angles. At second and fourth-floor levels there are stone balconies with highly ornate iron balustrades. 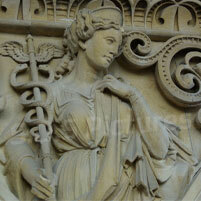 The fourth floor balcony has fourteen decorated corbels with an encaustic tile decoration between the corbels. At fifth-floor level there is a stone balustrade perforated with quatrefoils. There is polychromatic stonework forming the arches above these windows and to blind arcading at the sixth-floor level. It has a mansard roof with gabled windows to the south and north. The western curve is similar to the rest of the façade, except at third floor level the windows are arcaded with only 2 lights separated with granite shafts. At the furthest western corner of the building there is an arcaded porte-cochere supported by substantial solid shafts of polished granite from Shap in Cumbria, standing on unpolished plinths of the same stone. 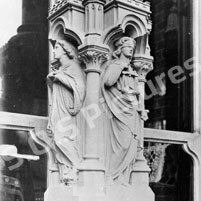 The square columns at the front corners are of stacked blocks of Sherwood sandstone from Mansfield and above the capitals elaborately carved stone featuring the arms of Great Britain on the Euston Road elevation. The arms of Edinburgh and The City of London are on the eastern elevation and the arms of Bristol and Glasgow are on the western (Midland Road) elevation. 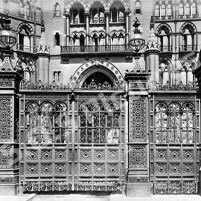 Above this is a terrace surrounded by intricate and elaborate iron hand rails; the first floor has five windows, the central three are cusped, 2-light, pointed-arch windows separated and flanked by granite columns with small gabled roofs, the outer two windows are single-light pointed arch window with granite columns either side. On the second floor there are five windows, the central three are 2-light with cusped arches, flanked and separated by granite columns and also flanked and divided by four statue niches with elaborately detailed gabled covers. The outer two windows are single-light cusped and pointed arches with granite columns on each side, and stone, corbeled balconies with iron railings. At third-floor level, again there are five windows, the central three are 2-light with arcaded, cusped arches. Again these windows are flanked and separated by granite columns. The outer two windows are single-light cusped and pointed arches with granite columns on each side. All five windows have stone aprons with a diamond and flower design in each. Above this there continues the scalloped frieze with a brick and stone balustrade, then a central stepped gable, flanked by a tower each side, rises to a gabled statue niche. There is one dual-height pointed-arch 2-light cusped window with ornate cinquefoil glazed light above. The window is flanked and separated by granite shafts. Chimney stacks all over the building were originally not fitted with chimney pots. 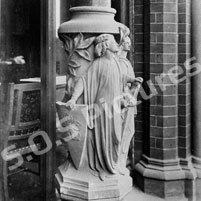 However, because of the height of the building it was found necessary to improve the up-draught to the flues to stop smoke lingering in the rooms and this was achieved by fitting 'vortex chimney pots' made of salt-glazed pottery by Baxendale and some by Brassington. These worked on the principle that an up-draught would be caused by air travelling up a spiral of tubes near the top and on the outside of the pot. There were several hundred pots to accommodate about six hundred fireplaces feeding 12,496 yards of flue (11,426m). Each Chimney stack had cast-iron plates attached giving the room name or number for the flue. All of the chimney pots were removed during the renovation works. The chimney stacks are now covered to allow use for ventilation. The west return elevation along Midland Road reproduces the elevation found on the principle façade in the first three bays. There were originally stone balconies on both first and second floor levels. Evidence of these can be seen either side of the windows, where all but one of the stone supporting corbels has been removed and there is subsequent brick renovation work too. Beyond this the long elevation angles back to follow the line of Midland Road with a 4-window range followed by a two-window range, at roof level continuing the double-stacked dormers as used in the main elevation. At street level there is a new staff entrance here, with a step-down in the pavement, protected by a steel handrail. 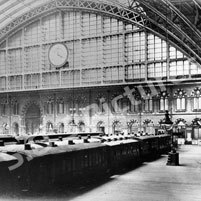 Then a single window on each level, originally to light the luggage room and luggage lift access, followed by a triple window which was actually to light the luggage and passenger lifts. At roof level there is a stepped gable over these. Then there is a full height stepped gable range marking the line of the grand staircase. After this, there are seven windows at street level followed by the original staff-entrance doorway. The hotel elevation lies back from the raised forecourt. In the retaining wall of this forecourt is a shop and this is followed by a gated entrance to a staircase leading up to the forecourt. There was a shop front here previously, but this opening is now used to access the western ticket hall under the forecourt. The design of the main elevation continues for five window ranges along the return, concluding in an octagonal turret which exists solely as a vent from the underground tunnel beneath. On a gable next to this shaft stands the only statue on the building - a larger than life-size Britannia complete with trident - she serves as the lightening conductor, which is carried from her by copper tape, connected to all the other aerial-like conductors all over the roofs. A door in the centre of this range provides access to a corridor at undercroft level which runs west from here to the four-arch break-through in the western ticket hall. 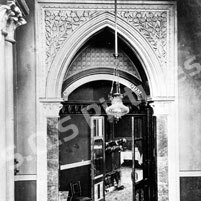 To the left of this door is a drinking fountain comprising a gabled stone block with granite eared and shouldered inscribed 'aedicule' having a semi-circular basin. 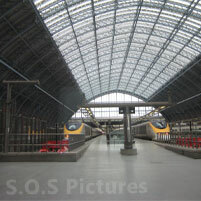 On the east flank of the train shed a two-storey structure with a lean-to roof, originally numbering No’s 9-91 Pancras Road. It is roofed in slates and on alternate bays there are chimney stacks. The structure has a 46-window range. At the north it curves slightly. The elevation of every bay is identical: on the ground floor a pointed arch opening set in a shallow pointed recess; all of the openings and recesses linked by a carved stone impost. 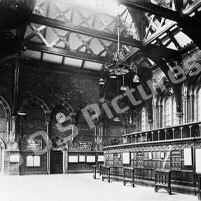 Many of the original shop fronts to the arches did survive intact, but some re-ordering was needed to create the International Station entrance at the twenty-first to twenty-fourth opening. A new glass and steel canopy covers the paved area outside this new entrance and announces ‘St. 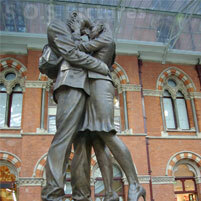 Pancras International’. Also surviving were carriageway arches to the storage area beneath the shed – the Undercroft, originally used for the storage of beer. These have double wooden doors with original ironwork, grilles and hinges. All were replaced with reproductions. North of number 91, the elevation steps up to a tower with a blind arcade near the top. The substructure of the station used to continue northwards to the first railway bridge, with the ground floor being articulated into bays pierced by pointed arches to number 111. 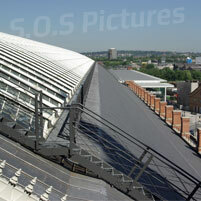 This section was swept away during the CTRL works between 2001 and 2004 to make way for the new extended roof structure. 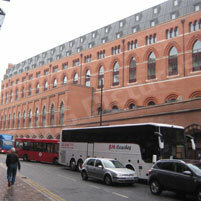 The new west wing has 58 arched windows incorporating 1,150 individual red rubber bricks. The building has 172,000 Charnwood handmade facing bricks and behind are a further 60,000 Charnwood handmade standard imperial backing bricks – 233,150 bricks in total. For additional information on the areas we cover and the range of services we provide please contact us or call us on 01843 290141 | 07778 932359.